We travelled to the Sydney Medieval Fair on Saturday and watched large men in chain mail hit each other with big swords. It was great! There was much trying on of chain mail and assorted helmets and sheilds. The fact that there were no real injuries or heads rolling, guts being ripped out, and limbs being torn asunder made it a fantastic family day. My favourite was the elegant rapier dueling by the ladies in corsets. It provided a welcome contrast to the general biffo of the large men and their broadswords. 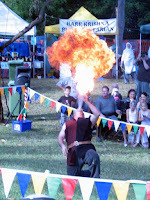 There was also fire eating and market stalls and wonderful Mayan Coffee in a leafy valley in Parramatta park. It was my first time at the Fair but if this is going to be a regular occurence I'll be coming back. That looks like good fun! I always enjoy watching the Morris Dancers at our Festivale.